For Nest Cam or DropCam owners unaware of IFTTT, it’s a free service that facilitates integration with devices and services such as gmail, Facebook, Instagram, and Pinterest. IFTTT is an acronym for “If This Then That”. You can do some very cool stuff with this service and this article will show you how to do it and highlight some of the capabilities. First thing to do is visit the IFTTT web site and register. Once you get there, you will notice what they call recipes. These are pre-written scripts to facilitate integration. Not all devices support IFTTT but Nest does. It allows integration between a Nest Cam and other services or devices that are not supported by Nest’s official integration interfaces. You can search for Nest Cam and will see dozens of recipes appear. There are also objects called channels. Each officially integrated device has a channel. Nest has a channel and you will want to activate that channel. When you activate the Nest channel, IFTTT will ask you to confirm that you are ok with the controls that you will permit IFTTT to operate. Click ok.
Now you can begin to use some Nest recipes. 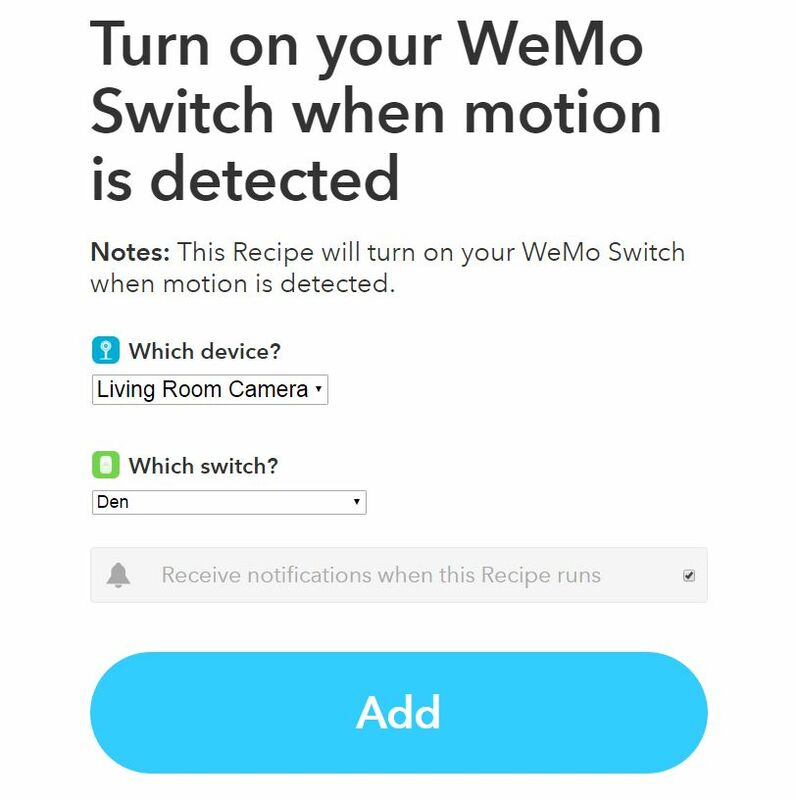 My favorite recipe is turning my Wemo Switches on when a Nest Cam or DropCam Pro notices some motion. Wemo is a device that allows remote control of anything you plug into it. I have used these for a long time and like Wemo a lot. A screen shot of the confirmations used to activate this recipe are what’s attached to this article. I have it setup so that when there is motion detected in my living room, the light in my den turns on. That should serve to scare the heck out of an intruder. Luckily (I guess), I have only scared my wife to date. Anyway this recipe is great and I have used it successfully in my home. Another great recipe allows me to receive a phone call whenever motion is detected on my DropCam Pro – but you can also do it on a Nest Cam. To do this, you will activate the Phone Call Channel. IFTTT will make a verification call as part of the process so you don’t wind up calling your alerts into a phone number that you don’t own. Once the Phone Call Channel is activated, and a motion alert is detected, you get a phone call when it occurs. The phone call tells you the location that you assigned to the camera and the date and time of the motion. This is a great feature for instant alerts to your home or cell phone. My experience is that the calls are typically received within a few minutes of the event. There are a few dozen additional recipes that allow you to control your Nest Cam. Recipes include the ability to post a photo of the activity that was detected to your Twitter account, emails to various recipients, an SMS message to whomever. You can integrate your nest Cam or DropCam Pro with a LIFX, Hue or Wemo lighting system. You can even keep a log of alerts to a Google spreadsheet. Great stuff that provides some nice automation and integration that isn’t documented in the Nest tutorials.